This continues the “see UG or Atlantis” unmasked tour. Thunder starts becoming a regular part of the roster, much to everyone’s disappointment. This show has the usual dizzy “all the Ingobernables booked but not in the same match” bit. It doesn’t look too good for a Valiente win, but there’s a better chance now that they’re post-Universal tournament and more willing to do random title changes. Pretty sure Sagrado is working lower on that card than he would’ve been as a tecnico. Also, a Panther in every match. Oro is working here and on Monday, which would be his first matches since his injury. They’re booking Dragon Rojo despite him still being hurt, so Oro is no sure thing. Main event could be very good dependent on who that replacement is. All these cards where Cavernario is working one or two matches higher than Cometa kind of gives away the finsih on Friday. Skadi also seems to wrestle in matches with Marcela. Special bonus podcast in the series of special podcasts: Jose Manuel Guillen of Tercera Caida joins us for about forty minutes of talk about his show and lucha libre. We will be back early Saturday morning. The most important bit: THERE IS NO LINK TO THE SHOW UNTIL THE SHOW IS LIVE. This is NOT uStream or something along those lines with a static page you go to wait for the stream. Terra posts a new page for each stream – same as if it was a news article – and that page is not posted until a minute or so before the bell time. CMLL Anniversary show starts at 8:30 pm Central Time. (Helpful time conversion page.) CMLL has announced a music ordinance starting fifteen minutes before show time, so the stream my sneak in early. Terra will post a link to the stream a couple minutes before. Action will not start until around 5-7 minutes after, so you should have plenty of time to find it. Terra does not post the shows after they air. It is live or nothing. I am efforting to record the show, but since I will actually be at the show, I will not be able to monitor the recording to see if it’s working. I believe other people will be trying to record and something should turn up eventually. Terra will not give out the link to the show directly, but they will remind you when it is occurring. Go here, enter your email address, and they will send you a message whatever time in advance you choose. They may even send you a direct link to the page, though I have not tried that..
Go to https://twitter.com/terradeportesmx (or follow then on Twitter) shortly after the show starts. They will always post a link directly to the stream, and they will repeat the link and share results during the duration of the show. CMLL’s offical Twitter (@CMLL_Oficial) will also RT the link during the night, but sometimes not at the start of the night. 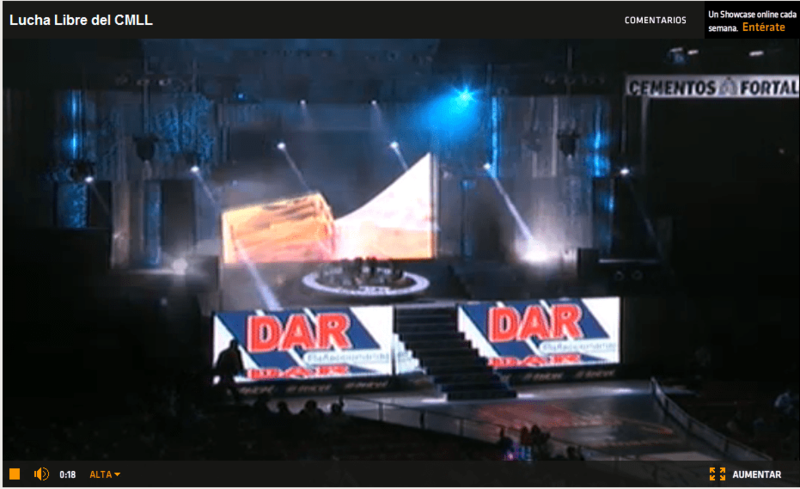 3) Once the stream is live (usually with in a minute or two of show time, but sometimes later), a link to the show will appear on the Eventos bar, about a third of the way down the screen. CMLL is usually listed as something like “Lucha Libre del CMLL”. Click on either the name or the picture. There is a stop/play button in the bottom left of the screen, a volume button, and a video quality selection. “Alta” is the highest quality feed, “Baja” is the lowest. If the video starts to hesitate or buffer, try switching to a different feed. “AUMENTAR” is in the bottom right of the screen, and allows you to watch full screen. Hit ESC to escape out of full screen. What Does That Orange Circle Mean? If you see that, it means the video player is having an issue buffering. It could be a problem with your connection – try changing the feed quality (Alta/Baja) to restart the feed. It also can mean the feed has died entirely, which does happen one every other show. It’s usually back within a couple minutes, but you may need to refresh or change feeds to pick it up again. The DF team beat the Queretaro team with a Belial inverted huracanrana on Alex and Arez defeating Belial. Money thrown in. Crazy match. Eliminator order went Angel/Astro, Fulgors, Karma/Castigador with Maverick and Psico surviving as the winners. Money thrown in. A fight in and out of the ring with a lot of big moves. Impulso landed on Fuego with a top rope splash to the floor for the win. Money thrown in. Drabeks were supported loudly by their hometown crowd, and one of them beat Trauma I clean. Money thrown in. third match of a series, tied 1 to 1. A fierce brawl, with the two tying up outside while they were counted out. They kept fighting for a few minutes after the end. This was a fun show live. I wouldn’t have ever imagined making it to Arena Queretaro and it was great to have that experience. ChilangaMask is running in Guadalajara today Saturday. The following ChilangaMask is in October in Monterrey, and they definitely have plans beyond that date. Brazo de Plata replaced Dragon Rojo in the main event, and Rojo said he’d be out for at least one more month. (It didn’t stop CMLL from booking him for next week anyway.) Hopefully Mephisto doesn’t get hurt this week. a mess – Mascara was feuding with Shocker and his partners during the match. Tecnicos took 2/3, with Mascara walking out in the third but Shocker chased him down and fouled him for the DQ. The tournament which had a reason to exist and then lost is now over. Marco posted photos of the cup over on his Twitter, and I hope he ends up using it as a popcorn bowl or something. Sky Man moonsaulted off an incredibly high balcony, wasn’t really caught, and landed hard. He somehow finished the match but was taken across the street to the hospital. Dave got visual pins in the third fall, but referee Maya was knocked out. Canek used a martinete on him for the win. Pirata Morgan replaced LA Park, who appeared but did not wrestle due to stomach issues. The Sky Man clip is everywhere. Money was thrown in, but probably not enough to pay for the damage he caused himself and definitely not the damage he could’ve done to himself (and to lucha libre in Mexico) if he had slightly missed. There’s at least five of these for right now…and probably about 10 later. Thrill as I watch all the IWRG and Puebla I shoudl’ve gotten to months ago. No shows today. We went on tours instead: around Mexico City, Tercera Caida and AAA’s office. And then we ate dinner with a Dragon Gate champion. A good day. Next podcast is after the anniversary show, but there should be fresh content before that.